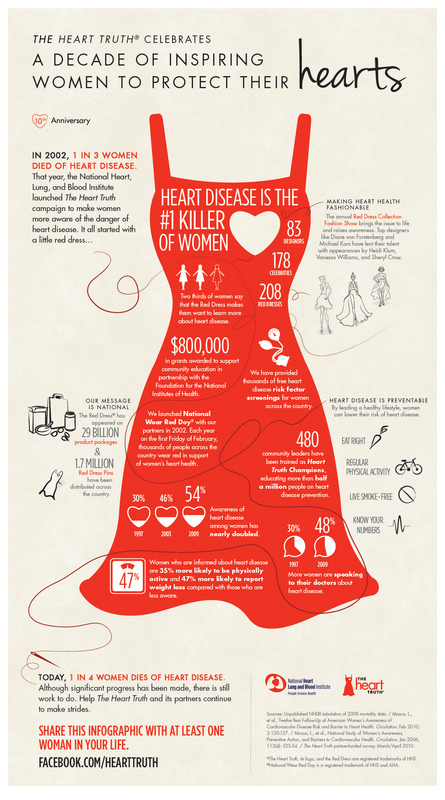 The hard truth is that heart disease is the #1 killer of American women. And it’s largely preventable. The Heart Truth® was started here at NIH’s National Heart, Lung, and Blood Institute to raise awareness of these truths. You’re probably most familiar with the campaign through its February 1st fashion statement, which has arguably become a cultural icon: the red dress. The Red Dress® is a decade old this year. And, like heart disease, it doesn’t discriminate by gender. Everyone can wear red today. It’s a symbol of solidarity – and a reminder that we should each attend to our heart’s needs every day: by making healthful decisions like exercising more, quitting smoking, and maintaining a healthy weight and blood pressure. Click on the image to view full sized.